Start selling PPC Services or Outsource Your PPC Management to Us and Boost your profits. PPCPapa’s White Label PPC Reseller program enables agencies and individual sell High Quality PPC Management services at great profit margin. We offer 100% white label ppc management services including Google Ads Management, Facebook Ads, Bing Ads, Instragram and Amazon Ads at great pricing. We offer discounts so that you can upprice and sell it to increase your profit margin. We will never approach any of your client. We will never share your client details to any other reseller or any third party, whatsoever. All the reports and pre sales/after sale support will have Your (Reseller Partner’s) Branding and Contact Details. You will be Managing Sales, Customer Acquisition, Billing & Invoicing, and Client Communication. We will take care of Overall Fulfilment, Reports, Results and technical Queries. All in all we will be your fulfilment center. We will provide you pre-sales training/proposal samples. We will update you time to time with industry updates so that you stay on top. PPC Reseller Program is very much helpful for Agencies and Individuals who want to sell PPC, make profit and save unnecessary cost of Hiring Staff and structure. Here are some of the key benefits of becoming our reseller partner. 100% White Label – Clients remain under your control/brand. White Label Report – Your Company’s Logo on reports. You manage client invoicing and billing. White Label Pre Sales and After Sale Tech Support. Save yourself from hassle and expenses from hiring fulfilment staff, taxes, structure fee and so on. Special discount on large volume accounts (Agencies/Large Accounts Managers). Who are our most profitable reseller partners? They outsource all the ppc fulfilment, reporting and tech support to us and save $$$$s on structure, employees and taxes by boosting their profit). Some PPC agencies outsource overall fulfilment and some outsource just part of it like “Additional work, which can’t be handled inhouse, Landing Page Design, Google Ads Design, Reporting etc. Most of the seo agencies outsource their overall PPC management. This enables them to keep offering the service as add on, boost their profit bottom line, save them from hiring staff and incurring additional costs. Web Design Agencies, Hosting Companies, Domain Registrars often sell SEO and PPC as add on services. You can sell the PPC packages as add on to your clients and boost your overall revenue and profit margin. IT and Computer Support and Media agencies too take advantage of selling PPC as add on service. No extra setup or investment require. Just become reseller and start selling ppc for profit. Agencies can sell PPC Management / Paid Search Engine Marketing as add on service and boost their overall sales and revenue. No extra budget/investment or fulfilment staff is required. Just sign up and get started. Often SEO and PPC Freelancers get overwhelmed with additional projects. You can become our resellers and boost your profit by letting us manage overall fulfilment and report and you focusing on more sales and billing. Own a call center or sales team or an Individual salesman? We offer great plans for you. Great commissions on sales + recurring fee share every month. On each sale get around $100+ and over $100 recurring each month after. Generally one client remains for minimum 6-12 months, so one time sale will get you recurring income for 6-12 months. $100 is the minimum share which goes as much as $5000 per account. Average call center sells around 2-10 packages per day (making minimum 60000-100000 a month). If you are individual salesmen, you can sell the add on service and we will share the first month as well as all months recurring payment. 10 clients a month will mean you will get a minimum of $1000-$10000 a month. No matter you none of the above and have no prior experience in selling PPC. We can help you setup your own PPC Agency. Most of our resellers have website, but in case if you don’t have a website. We can help you with domain registration, hosting, website design and onsite optimization, as well as ppc campaign setup for lead generation and sales kit – It will cost all around $950. In case if you want to get these set yourself, we can offer you free guide too. Anyone, who is willing to sell PPC for profit. - Do you charge any fee for reseller program/signup? - Do you offer custom reporting? Yes, but this is limited to large resellers and high spend account owners. - Do I need technical PPC Knowledge to sell PPC services? No, we are here to help you. - How to Sign Up? I have been working as a Reseller Partner with PPCPapa for the longest time. Its efficient and proficient team delivers what it promises. 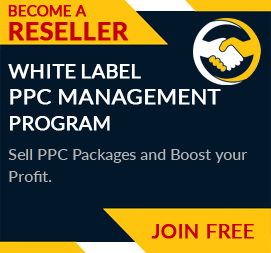 They have systematic PPC Reseller Programs that help in maximum profit generation.